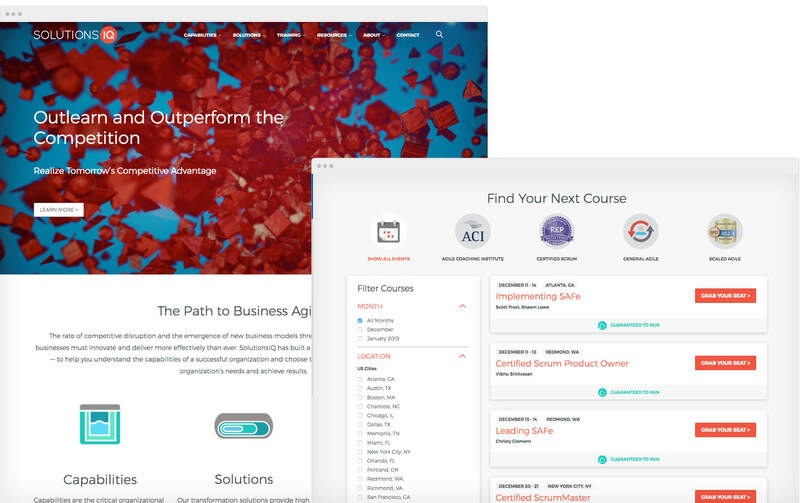 We provided a comprehensive rebrand for SolutionsIQ, a leader in Agile consulting and training. We built flexible landing pages, a sophisticated event calendar, resource library with varied media, and a job board. We couldn’t be any happier with the way our new site turned out. Working with Bill has been such a joy. His understanding of what we wanted and willingness to explain technical details throughout the project was outstanding. He was always clear, responsive, and professional. His ability to provide creative solutions for the functionality we wanted was truly impressive. With our new website, it’s so much easier for our staff to manage content and create customizable landing pages. We developed a modular template with over a dozen module types, each with customizable options. This provides the staff with incredible flexibility when building out landing pages, while maintaining a consistent brand and fully responsive layout throughout. Some modules, like Events and Resources, allow dynamic querying of content, ensuring the pages always show up-to-date information on upcoming events and the most recent relevant resources. SolutionsIQ required a very sophisticated event calendar with many filtering options, while maintaining an easy-to-use interface that works well on mobile. Multiple filters can be used at the same time (ex: month, location, and event type), and events feature differing calls to action based on certain criteria (ex: “Join the Waitlist” if event is sold out). Instead of manually entering content on single events, it is dynamically generated based on event metadata (price, date, time, signup link), and linked data (event type, location, instructors…). Any changes to the linked data source, like the description and image of a specific location, automatically update every event at that location. We built a resource library featuring many types of content. The library can be filtered by both topic and resource type. We customized the URLs to reflect the content type. The Careers page integrates seamlessly with Jobvite, the third party service they use for managing recruitment. When editing modular pages, you simply select the modules you want and fill in the relevant details. It’s easy for non-technical staff to manage content across the entire site.